Or Justice in the Tarot also symbolizing Virtue, i´m not sure justice is for all, and i´m not much on a believer on something bigger who´s sword will strike and repair all injustices, i do believe in balance tho and the one we provide ourselves. A sort of karma where what you give to others you will get receive, where justice is dealt by our own hands, making us judge and jury of our own fate, thru our behaviour, a constant reminder of how the scales tip not according to others but to our own moods and actions. 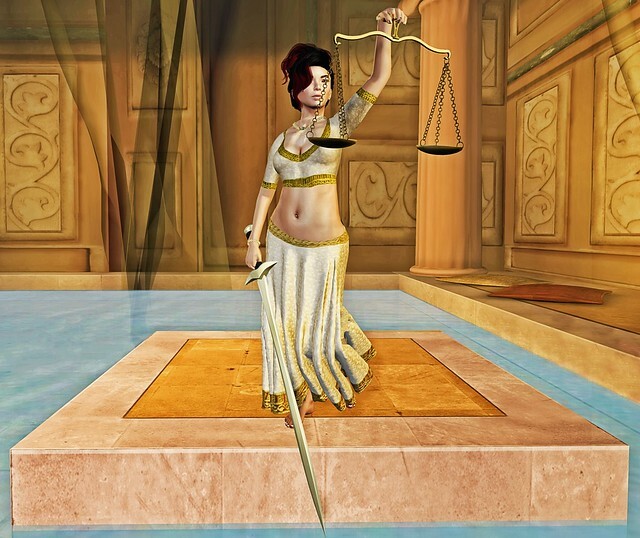 Studio Sidhe´s amazing pose shows just perfectly the serenity and posture of Justice for me, i used it here with another two exclusive Zodiac items, that will be available until the 17th and the end of this cycle. The beautiful and again impressive Essences release, i´m growing extremely found of their work, as i see it improve from month to month, and this lovely and delicate jewelry set from CoLLisions. 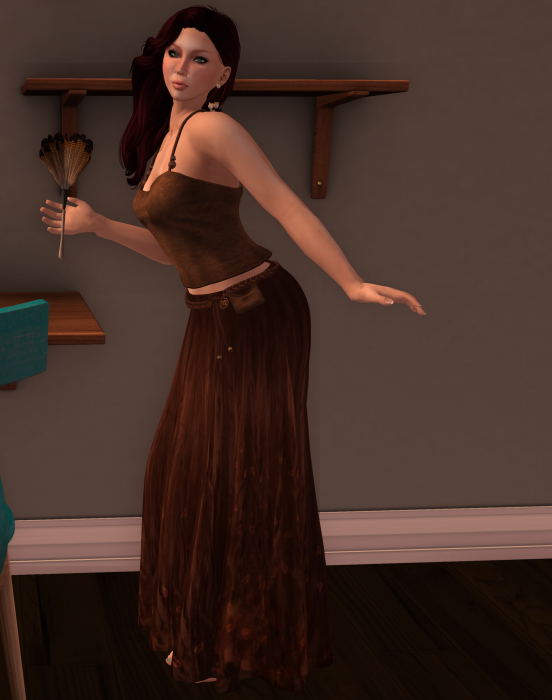 I also finally was inworld to actually go shopping so i stopped at Truth for some new hair, and grabbed another colour of Bilo´s saris i was missing. Just remember folks although a tad grave sometimes, there is also a kinder gentler face to Justice, and most of it is sometimes in a smile and a hug after a long day. See you all soon and have a beautiful weekend next to those you love. If you have not had a chance to come and shop the Virgo round of Zodiac.. today is your last chance. Libra will start back up on the 23rd of September so zip in and pick up some things! One of my favorite things to come from this round was this feather duster set from Cheeky Pea and Exposeur. The set is called the fancy feather set and is a set of poses holding this duster. It is pretty adorable and could make for some fun photos. The other thing that I am wearing in this photo is the skirt and top called Kasia from Evie’s Closet. I love the autumny brown color and the flowing skirt. This round of Zodiac is in full swing, and there are so many adorable Virgo themed things waiting for you! Even if you aren’t a Virgo, you will still find something you are sure to love! I’m wearing the cute Sitari outfit from Elymode that is availlible only at Zodiac! It comes in 5 mix and match colors! Each set has two different shirt options, a partial mesh mini skirt, socks with and without wheat and undies! So many different ways you can wear them! I’m using a pose from aDORKable which is also availlible this round of Zodiac. 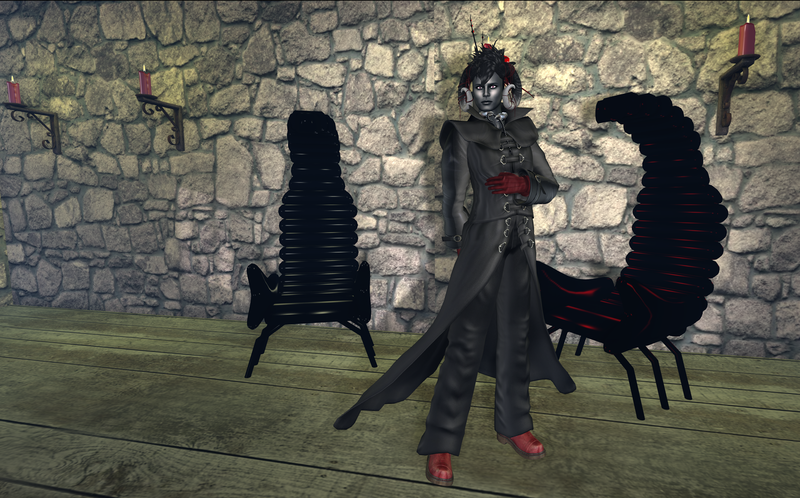 I happened to have chosen one of the Calm Poses, but you can also pick up the Shy Poses there! Each pack comes with 5 poses plus mirrored versions! The new cycle of Zodiac is in full swing. This month is the time for Virgo which is an earth sign. This means they are grounded and in-touch with nature but are also perfectionists and hates sloppiness and disorder. Their colors are brown and green and their flower is Morning Glory. I decided to go with the earthy side of Virgo and put together this sort of bohemian look. The skirt is a lovely piece from Evie’s Closet and is available at the Zodiac. It has a base of mesh and wisps of flexi to add to depth and movement. It’s a clever way to make maxi skirt, something I’d like to see more often. Also at the Zodiac you will find the Virgo Ring from AddiCt. It depicts the cirgo sign and comes in 4 different colors. I paired it together with this bracelet from Collisions which is a part of a set also available at Zodiac. Morning everyone, time for some cleaning and dusting, because the second edition of Zodiac, this time themed Virgo opened doors yesterday, and the mob trying to get in left the place a mess, well not really, i´m just channeling my inner nonexistent Virgo and being methodically clean, which is one of their characteristics it seems. Sadly not for me in RL. But anyways, here we are and now we can all dust off memories, the dusting itself comes from this fun and different pose set a surprising collaboration from Exposeur and Cheeky Pea, fr this months edition, 5 poses with matching prop, all cute and tidy. Also from Cheeky pea this really cute frame with polaroids, that you can replace with your own, unlike i did using the ones that came with the frame, i have a tendency to do that in rl also, for months, until i actually pick and print pics to hang.